Whenever I make this, I have visions of a Nina Simone-esque alter ego, sipping a tall glass of iced coffee, before performing the pants off of everyone in the room. Yes, yes, I know milk isn't exactly good for one's singing voice, but hey, indulge me, wouldya? The strains of bluesy jazz songs starts filtering into my thoughts as soon as I take the first sip of this decidedly grown-up version of iced coffee. Don't ask me why, imagination is an odd thing. Which, granted, are both a whole lot less glamorous, but hey, at least it's the truth. Some more hard hitting truths - this iced coffee is addictive. Buy a couple of tins of coconut milk. Heck, buy a couple of dozen while you're at it. Trust me on this. Even TheHusband, notorious coconut milk hater, loudly demands that I make this on an alarmingly regular basis. Which, of course, being the awesome wife that I am, I do. Just do me a favour, would you? Don't tell him how ridiculously easy this is to make. It'll kinda spoil the whole martyr vibe I've got going on at home. PS: Want another moment of truth? That artfully staged coffee stain over there? Not staged at all. Clumsiness is the new art, haven't you heard? 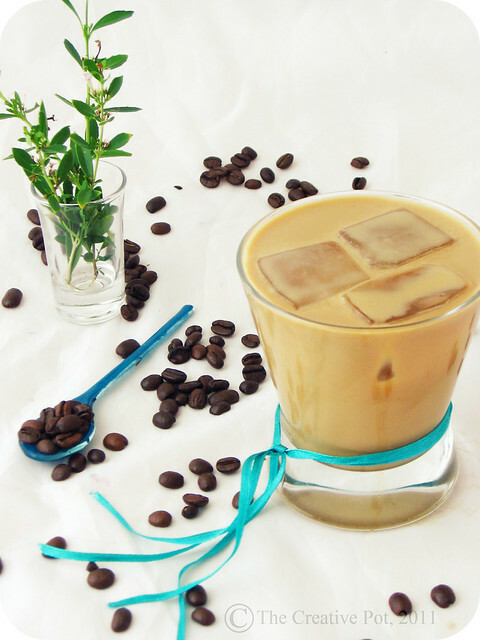 If you really can't bring yourself to use instant coffee, brew a pot of triple strength coffee and use a few tablespoons of that as the base of this iced coffee instead. 1. Add coffee granules, sugar and boiling water to a glass, stirring until the coffee and sugar has dissolved. 2. Add coconut milk and vanilla essence, stirring to fully incorporate it into the coffee mixture. 3. Top up with cold water and cold milk, add a few ice cubes and there you have it. See, told you, easy as pie. Don't be tempted to add the last few ingredients in any old order - the coconut milk will not properly mix in if added after the cold water and milk. For some reason it needs some heat to work its magic. This bit of info is brought to you by: Bitter Experience. @Swathi - It's a super combo, isn't it? Can't believe it took me so long to figure out. @Joanne - You've got that right. This will work for a post workout lift too. I love the combination of coffee and coconut. Lovely! Never tried this combination, picture looks stunning. You are so right, it will be a perfect start to my day!! I'm going for the martyr vibe too! 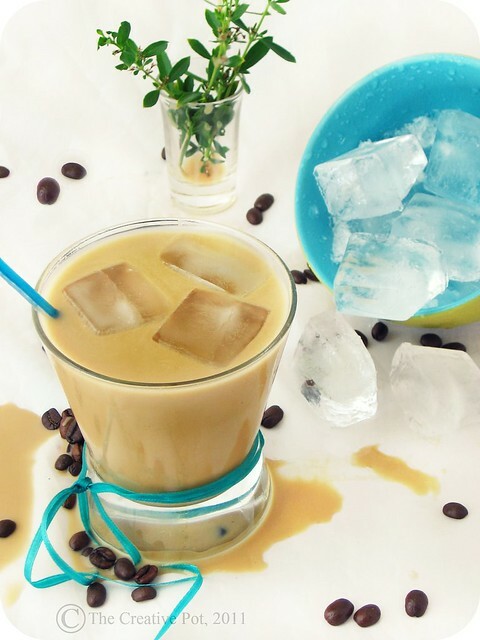 My husband loves iced coffee, I think I'll make this for him. Thanks for the recipe. this sounds like a lovely summer drink. Yummy. Never thought of making iced coffee with coconut milk. YUM! So lovely, must try this recipe soon! Ahh that looks so delicious, perfect for hot weather! You should try cold-brewed coffee, it is so easy to make and is less bitter than coffee brewed by other methods. Hi how have you been? Haven't been to your blog for some time. Your iced coffee looks GREAT. The way you have presented the iced coffee is really nice too. I have noticed some really nice photos on your blog. Are you a professional food photographer? Why did you choose to prevent pintrest users from pinning your images? 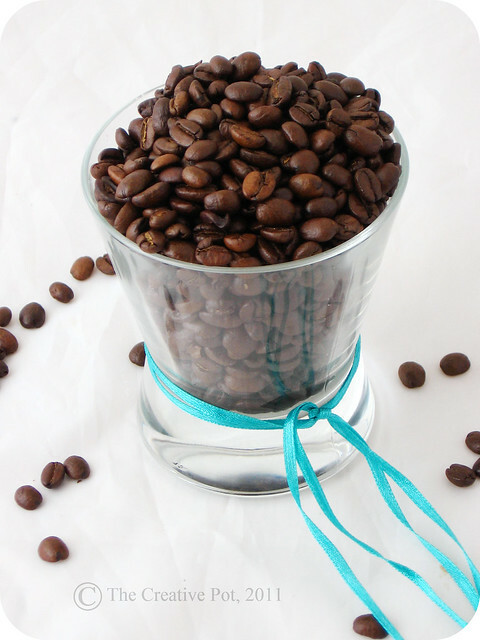 This is a great recipe, and I'd love to pin it to my coffee board! I made it yesterday and today - not sure how much I like it. Maybe I'm not the coconut fan I thought I was! What kind of coconut milk do you use? from the can or the refrigerated kind?